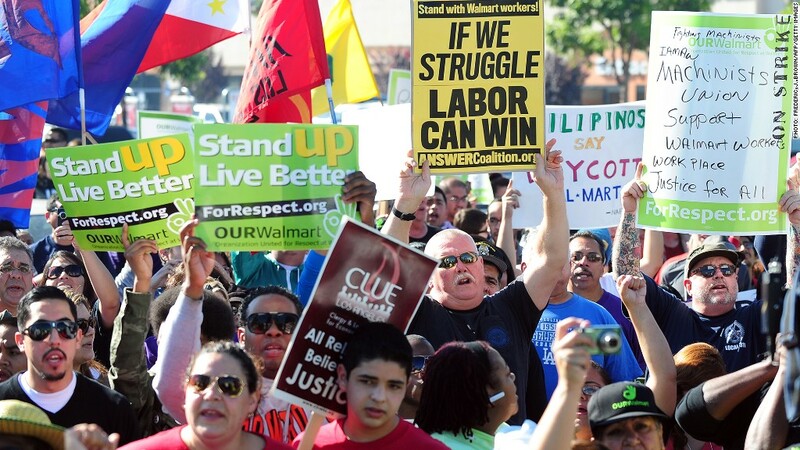 Thousands protested at Wal-Mart stores on Black Friday, the latest in a string of worker walk outs and strikes across the country. Over the past week, port workers in Los Angeles went on strike. So did fast food workers from McDonald's and Burger King. And last month, it was Wal-Mart workers. What gives? It's a message from workers that they have finally had enough, labor experts say. Having endured a deep recession, when their jobs were imperiled and their low wages remained unchanged, workers have been under tremendous stress. Now, they've finally reached a point where they're willing to put their livelihoods on the line. Workers, after all, can be replaced if they strike for economic reasons under the National Labor Relations Act. "It's very, very risky for workers to go out on strike," said Angela Cornell, director of the Labor Law Clinic at Cornell University's law school. "It might be that they've just had it." Among striking workers, the themes are common across all industries. They are staging walkouts and protests for higher pay, better working conditions and the right to speak out and form a union. Labor experts say that the workers' wages have fallen, and stand in sharp contrast to the performance of companies they work for. Corporate profits were up 19% in the third quarter, the greatest share of the economy in history. "You find out that your hard work is paying off and the company is doing well, and you're being asked to work for $8 an hour," said Cornell. McDonald's (MCD), the world's largest hamburger joint, hasn't fared so poorly. Last year, sales increased 12%.The largest U.S. retailer Wal-Mart (WMT) hasn't fared so badly either. Even at the height of the recession in 2009, the company's sales rose 7%. Workers' wages, on the other hand, have fallen to their lowest-ever, as a share of the economy. Raymond Lopez, a 21-year old shift manager at McDonald's, makes $8.75 an hour, after working there for two years. He joined one of the protests in New York City last week involving dozens of fast food workers from Burger King (BKW) and Yum Brands (YUM) restaurants KFC and Taco Bell. His wage was lower than the median pay for the nearly 50,000 fast food workers in New York City, which is $9 an hour, or $18,500 a year, according to the New York Labor Department. That's about $4,500 below the Census Bureau's poverty income threshold level of $23,000 for a family of four. Lopez says he has works two other jobs -- at a caterer and a condominium -- to pay his bills. As the recovery takes hold and the disparity in worker compensation and corporate profit widens, the number of labor strikes has grown. Last year, there were 19 major work stoppages that involved more than 1,000 workers. That's the highest since just before the recession in 2007, when there were 21 total work stoppages. The number bottomed out to just five by 2009, and climbed back to 19 by 2011. The total for 2012 won't be released until February, the BLS said, but monthly reports excluding November and December show 11 stoppages so far in 2012. Last week, 800 clerks went on strike at Los Angeles-area shipping ports. The workers, who have been without a contract for more than two years, claimed that shipping companies are trying to outsource good paying union jobs. The strike ended late Tuesday after eight days when workers reached a deal with management. Also last week, the New York fast food workers demanded higher pay and the right to form a union. 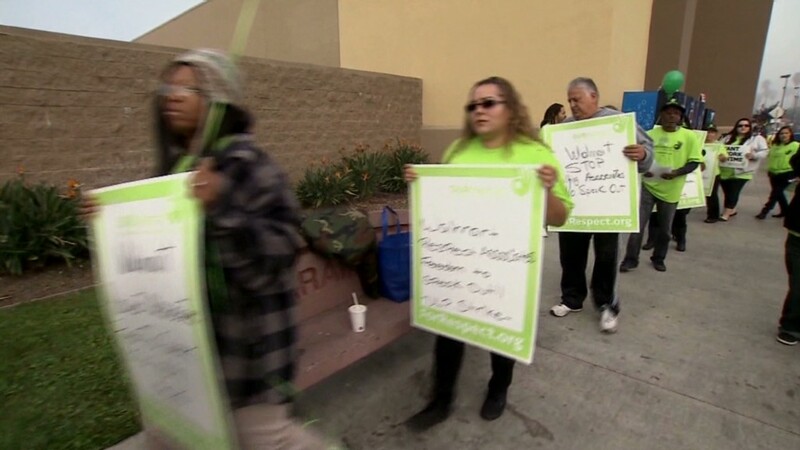 And a week earlier, Wal-Mart workers protested for the right to speak up to managers about wages, hours and benefits. Cornell said that the increase in strikes shows that workers feel safer in their jobs now that the economy is seeing signs of improvement. They also feel more comfortable and justified in demanding more from employees and less worried about being replaced. The unemployment rate has fallen from 10% in October 2009 to 7.9% in the same month this year, according to the government. "There's more of an awakening and more self-assertion," said William Gould IV, who chaired the National Labor Relations Board under President Clinton and is now a law professor at Stanford University. "That's going to continue."